Make your own pipe cutting templates. 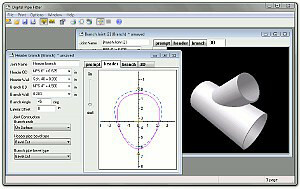 Digital Pipe Fitter software prints pipe cutting templates for a large variety of pipe joints. 3D visualization of joints makes this software easy and fun to use. You will be able to build joints you never dreamed that you could. This software lets you print to any printer or export to an AutoCAD® DXF file. Choose the type of joint you want, enter pipe sizes and desired dimensions, print a template on your printer, wrap the template around the pipe, and cut on the line. It's that easy to create template patterns for saddle joints, miters, rolling offsets, wyes, segmented turns, cone miters and much more. Digital Pipe Fitter even includes node joints for use in truss structures. Upgrading your PC? How to update your license for a new computer or after upgrading to Windows 10. Watch the product summary video. See other Digital Pipe Fitter videos. Version 1.92a is now available. A great software tool for welders, structural designers, fabricators or anyone who cuts and assembles plastic or metal pipes, tubing or sheet metal.